I have been meaning to go back and weigh out all the ingredients since I wrote it all out the first time. I measured it all with my dry measuring cups and weighed each ingredient after. This gave me basic weights to go by. Hopefully, my cookies will be more consistent this way. I have added the weights next to the volumetric measurements in the recipe. I used fractions because that is what my scale uses. I also poured some oatmeal into this batch and they seem to have come out just as good! 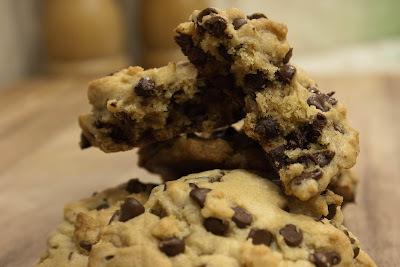 I really wanted some chocolate chip cookies but the last time I used Alton Brown’s Chewy Recipe, the cookies ended up being too sweet, too salty, and too greasy. I thought about it for a while. 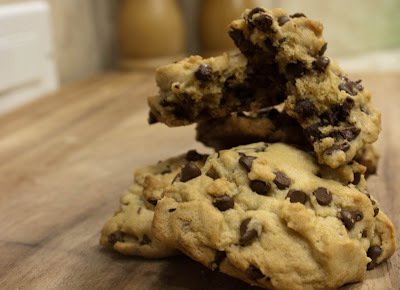 I am always adding stuff to cookie recipes like, cranberries and oatmeal. I am constantly making up successful regular food recipes as well. Why couldn’t I change around the basic ingredients to suit my tastes? 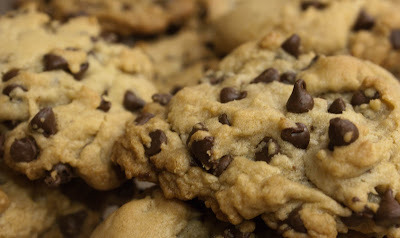 The overall texture of the cookies was what I wanted so I didn’t think I should change them too much. Just enough that they wouldn’t be too greasy and too sweet to eat. Around 8pm, since Chuck wasn’t on tonight (>:( ) I decided to fill the void with cookies. I grabbed my trusty recipe and made some changes. I cut the amount of butter, brown sugar, and kosher salt. I liked the idea of biting into the cookie and getting a touch of salt but the way it was the last time I ate it, the cookies were too salty. Here is my revised recipe. I melted the butter in a medium saucepan over low heat until the butter was almost completely melted. Then I turned it off so it would be relatively cool when I mixed it with the sugar. I whisked the the flour, salt, and baking soda in a small bowl and set it aside. Next, add the sugar and brown sugar and melted butter into my KitchenAid’s work bowl. I mixed them on a medium speed for a good 2-3 minutes, while I put the egg, yolk, milk, and vanilla into a small bowl. Once the sugar and butter were mixed, I put added the egg mixture. After the mixture came together, I slowly incorporated the flour mixture until everything was thoroughly combined but not over mixed. Finally, I added the chocolate chips and mixed on the stir setting. At this point, I transferred the dough to a small glass bowl (because my fridge is PACKED with greens from the CSA box I received on Saturday) and let it chill for an hour. I lowered the temperature to 350F from the 375F in the original recipe because they were cooking around the edges way too fast. The butter was also re-melting and causing the cookies to spread a bit around the edges. This made for a raw cookie in the middle if I took them out of the oven when the edges were golden brown. By making the cookies smaller and lowering the temperature, I found that they cook way more evenly and keep their shape much better. Cutting the butter, sugar, and salt in the recipe just slightly made for the same chewy awesome cookie Alton Brown was going for without them being so greasy or overly sweet/salty. I think from now on, I will be making them this way. This is the first time I have thought to change a baking recipe and I think they came out pretty amazing. Posted by galadriel07 on March 7, 2011 in The Bakery! I decided that I wanted some cookies so I went ahead and made some of Alton Brown’s graham crackers and some chocolate chip cookies from a recipe Laurgasms gave to me. The recipe for the graham crackers is already posted here (https://jheregeats.wordpress.com/2008/11/22/baked-goods/) but I will post the recipe for the cookies. The link I was given for the recipe is: http://easypeasyrecipes.wordpress.com/2008/12/13/the-best-chocolate-chips-cookies/ When I made them, I did about a tablespoon of dough per cookie. 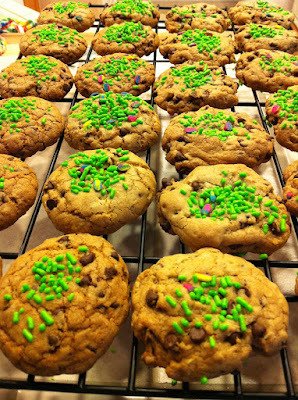 I made them about the same size as the Nestle Toll House ones I usually make. I am working on cooking times because this recipe says to bake them at 325F for an undisclosed amount of time. I baked mine at 350F for 8-10 minutes. I wouldn’t go much farther than 10 minutes tho because they dry out in the center pretty fast. Also, I used mini chocolate chips and that seemed to work out better for me. Another friend made this same recipe with white chips and macadamia nuts which he said was super awesome. 1. Adjust oven racks to upper & lower -middle positions; heat oven to 325. Line cookie sheets with parchment paper. 2. Whisk dry ingredients together; set aside. 3. With electric mixer, or by hand, mix butter & sugars until thoroughly combined. 4. Beat in egg, yolk and vanilla until combined. 5. Add dry ingredients; beat at low speed just until combined. Stir in chips. 6. Roll 1/2 cup dough into ball. Holding dough ball in fingertips of both hands, pull into 2 equal halves. Place formed dough onto cookie sheet, leaving room between each ball. 7. Bake, reversing position of cookie sheets halfway through baking, until cookies are light golden brown and outer edges start to harden yet centers are still soft and puffy. 8. Cool cookies on sheets until able to lift without breaking and place on wire rack to cool. Posted by galadriel07 on January 15, 2009 in The Bakery!